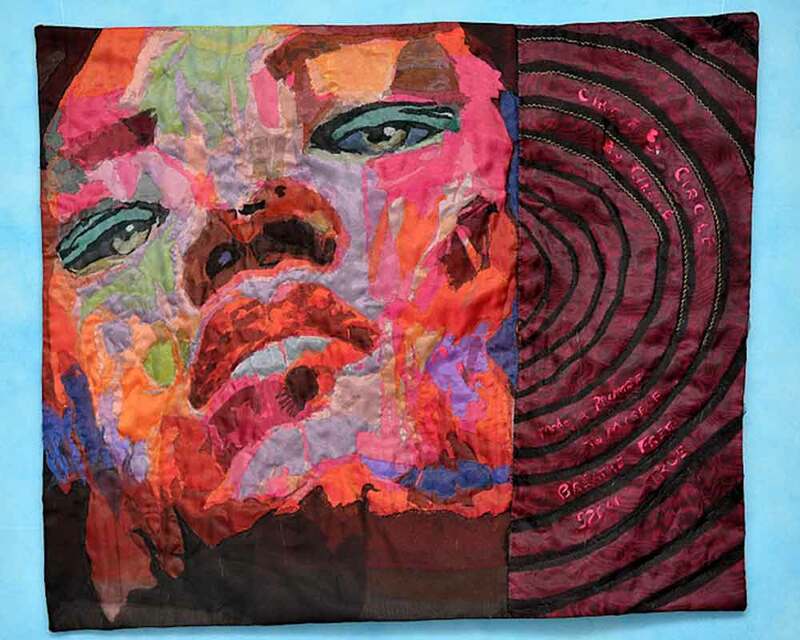 Nana’s portrait in this quilt is the appeal to the deity of the murky water, to serve as a repository for deep thinking that can guide one through the agency of that which is not transparent, nor clear, nor easily navigated. While there are the deities that guide through the sea and river water where sight is most available and clearly defined, Nana operates in areas where there is less clarity and the intuitive force has to be relied upon to navigate the water of life, the “Perfect Storm” depicted by the circular rings of the quilt. Nana is represented in the pantheon of deities in Nigeria with mounds of purple raffia. My introduction to Nana occurred while on residency in Brazil in a house of Condomble just outside of Sao Paulo. I encountered the Condomble devotees of Nana in the house of Oshumare who were adorned in deep pink and purple. As Ladies of Nana danced for the celebration of the children in the Festa de Eres, their movements were offerings to protect the children of Brazil for the coming year. The transportation of the African religions to the Western Hemisphere through the Middle Passage is evident in the manifestations of ritual associated with the forces of earth, air, fire and water as represented in the cultural relocation of Nana and her piercing sight. Wherever there is swamp water and deep water, there is the face of Nana.